This editorial addresses the effects of toxic stimuli combinations on determination of safe Exposure Limits. Examination of thousands of Medline abstracts showed typically that combinations of toxic stimuli can produce damage even when the exposure level of each member of the combination is less than the lowest exposure level of the member that produced damage when tested in isolation. The synergy of the toxic stimuli in combination means less of each component stimulus is required to cause damage compared to exposure levels when tested in isolation. 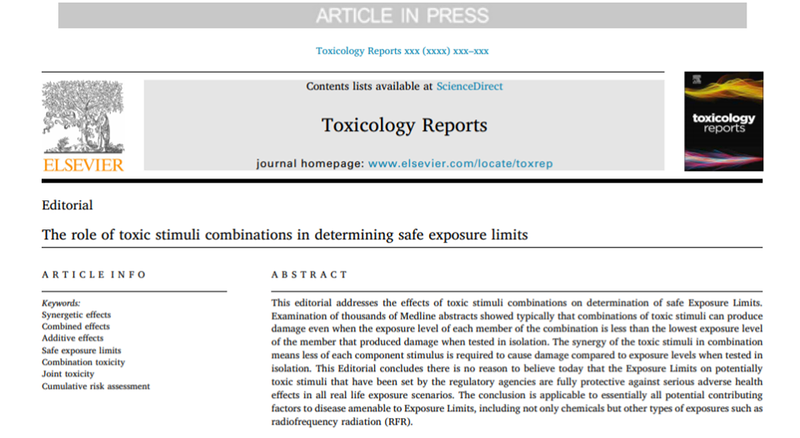 This Editorial concludes there is no reason to believe today that the Exposure Limits on potentially toxic stimuli that have been set by the regulatory agencies are fully protective against serious adverse health effects in all real life exposure scenarios. The conclusion is applicable to essentially all potential contributing factors to disease amenable to Exposure Limits, including not only chemicals but other types of exposures such as radiofrequency radiation (RFR).